The bad behavior of Chinese tourists make buzz just now. They are more likely to travel but also to being reprimanded not only by the host countries but also by the Chinese government. Chinese government has established a black list, in order to penalizing Chinese tourists having inappropriate behavior on the sights. 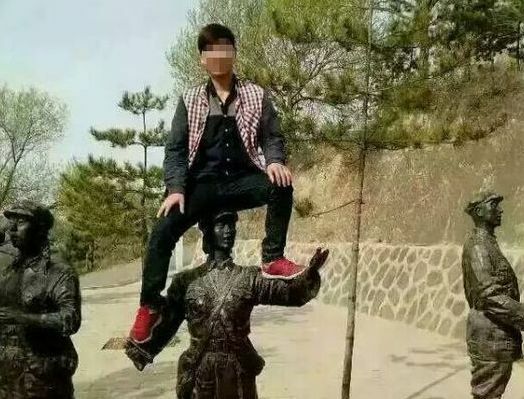 A Chinese teenager took a break, sitting on the head of a statue of a revolutionary soldier. He thus became the first tourist to be blacklisted by the Chinese government. Wenchun Li, who works in a hotel, was visiting Red Army Memorial Garden when he decided to climb the statue to take a photo. 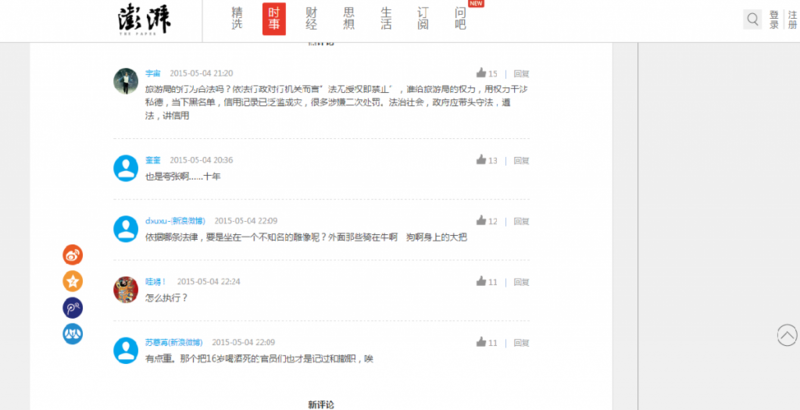 According to the national Office of Chinese tourism, the photographer has aroused a strong reaction on social networks, users demanding a public condemnation. The fact is that Yan’an is a historical place worship, recognized as the place where the Red Army of the Communist Party found refuge after the famous march from 1934 to 1935, hence the sharp criticism on the part of users. The National Tourism Office has announced on its website that Li Wenchun has been placed on the blacklist and that he would remain there for 10 years. Li said to have voluntarily apologized to the local tourism office, and then he wrote a letter of apology to the entire nation. The Chinese government recently promised to appoint all the shame of Chinese tourists who stand badly abroad, thereby improving the order and respect to tourist sites and reduce damage to China’s image on the international scene. Indeed, many facts have emerged in recent years as a young Chinese opened the emergency door in an airplane or a Chinese accused of having his name engraved on a 3500 years old temple in Egypt. You can read also this article. State media have nonetheless declared that to be included on the blacklist tourism could harm the ability of citizens to obtain a bank loan or a visa application. According to China Daily, Chinese tourists can be punished for “lack of respect for local customs, non-respect of the environment and historic monuments sabotage”, but also “disruption of public transport, participation in pornographic activities.” The rules put in place by the government also state that the tour guides have the right to monitor and report bad behavior tourists. However, facts relate that some tour guides don’t behave very well either. Analysts say the system blacklist puts two current concerns of the Chinese authorities in relief. The first concern is that the government seeks to appease the anger of the population by getting rid of corruption in all sectors, and the second is the will to stop the bad behavior of Chinese to bring a better social climate. 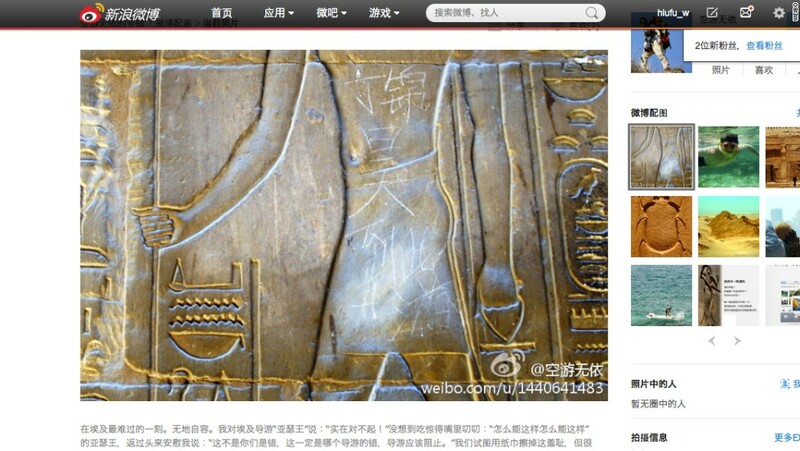 Chinese media reported this week a new fact, a Chinese would have carved his name on the wall of a temple in Chengdu. Moreover, Chen Chunyan, a guide working in Yunnan Province, was filmed insulting a group of Chinese travelers, too stingy recitals of not wanting to spend a lot of money in gift shops. The tourists took advantage of a low price offer to join the trip organized by the guide. These cheap trips are just a way for guides to exert pressure so that tourists come to spend money in stores selected in advance by the travel agency, although it is not officially allowed. The company for which worked Chen was penalized by a fine. Chinese tourism is a rapidly expanding sector. However, if the attitude of the tourists don’t change, many countries will be against their coming. If you want more information about Chinese tourism, click here. Chinese tourists, like other people, at times break rules or social norms; sometimes deliberately, sometimes unknowingly. Unfortunately the most common responses I see in our local tourism industry are not to address the issue with visitors and then grumble later, or, to get inappropriately angry. It is possible to actively manage issues in a way that does not offend the majority of well-behaved guests while significantly reducing problems. Chinese have to be have them-self!